Let's analyze how offensive rebounds have changed over the last seasons. Welcome back to Corner Stats! 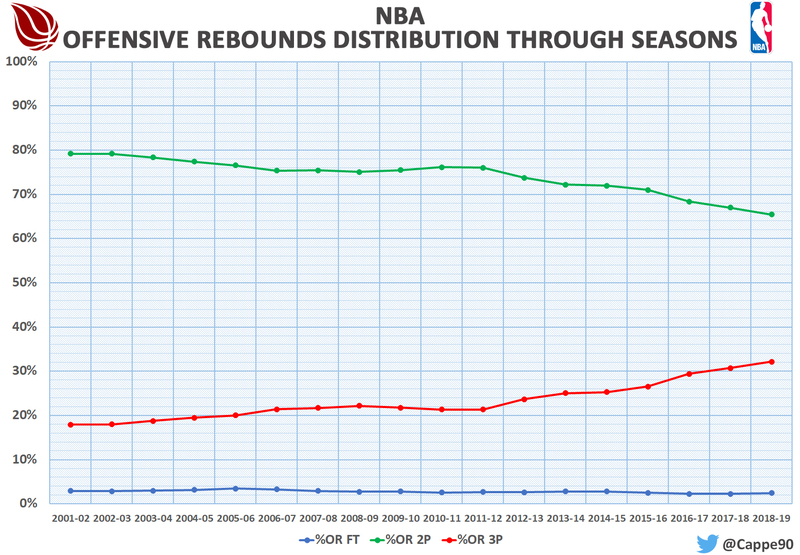 With today’s article, we will analyze the offensive rebounds evolution over the last few years in the NBA. Here we go! As you can see, the rebounds per 100 possessions have decreased and with them the relative grabbed percentage. These two declines can be explained through several factors. 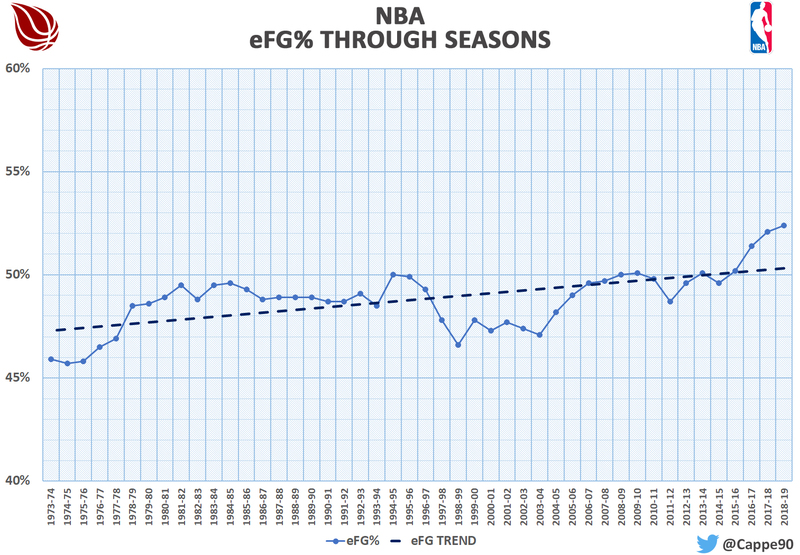 The chart above shows the eFG% evolution and its trend, an emblematic example of how today there are fewer missed shots. 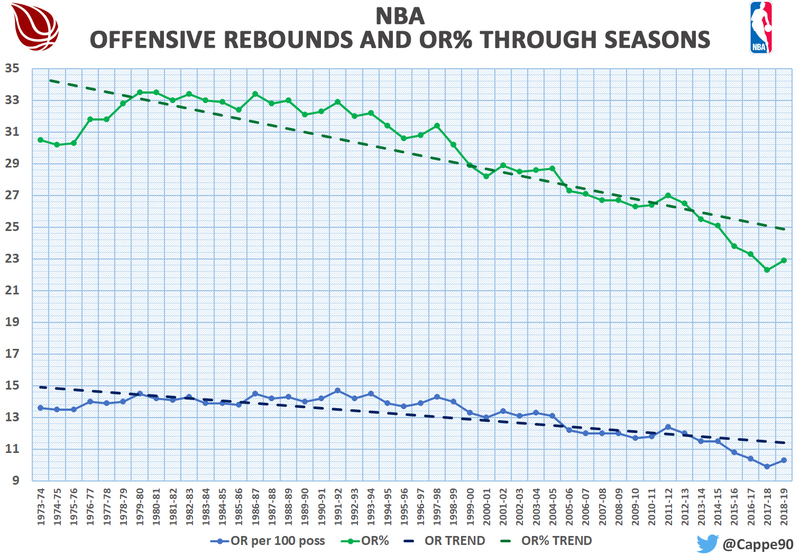 However, this trend only explains the drop of total offensive rebounds: OR% trend tells us that today there are fewer won rebounding battles than in the past. This fact is the consequence of another factor that over the years has strongly changed: the spacing. The best way to show how the spacing of NBA teams has changed is through the 3-point shot. Actually, there are statistics that try to describe the quality of a team’s spacing in numbers, but I think that for this analysis it is sufficient to use the 3-point shot, as it is the main factor of spacing. Ok, as we say in Italy I do not discover the hot water with this chart, but this is for sure the main factor that influenced the OR% drop. As the triples increased, the men on the perimeter also increased: consequently, the players who could actually fight to rebound decreased. The rebounds grabbed after a free throw always remained around 3% of the total amount; the rebounds that have changed a lot are those following a 2 and 3 point shot. 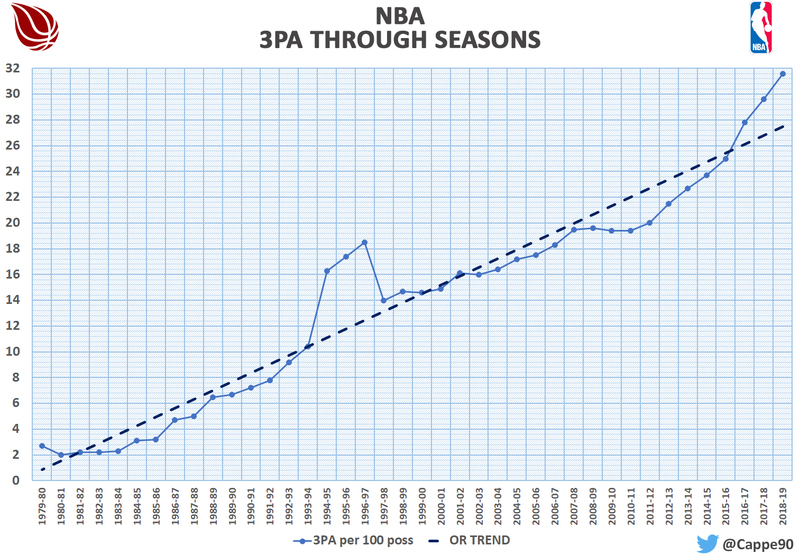 Those from 3 points increased (+ 14%), while those from within the arc decreased (-14%); it is clear that these percentage trends must be analyzed remembering that the total amount of OR has fallen over the last seasons. In other words, the offensive rebounds grabbed following a 3-point shot have increased, but because shots from that position have increased a lot. It is clear that the easiest rebounds to capture are those following a 2-point shot; in the Moreyball era, this shot rate has decreased due to the abandonment of the mid-range and this caused the decrease of the rebounds themselves. In conclusion, the current play style has influenced offensive rebounds: they are grabbed less because the players tend to be at a greater distance from the basket.